A joystick used to control Apollo 11 and a recording of Neil Armstrong's heartbeat as he landed on the Moon have been pulled from RR Auction's highly anticipated May 23 auction of space memorabilia. The items have been removed from the sale, along with a complete tool kit carried on the final manned Moon mission, after NASA asked for more time to research their ownership. NASA's general counsel will now investigate whether the items are still federal property. The move stresses the importance of obtaining items with a strong provenance. 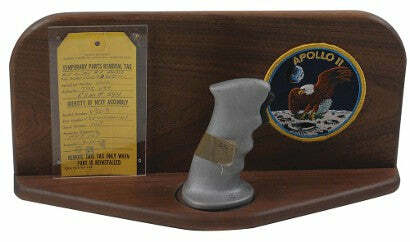 PFC Auctions has some fantastic space collectibles, each of which is issued with a letter of provenance.